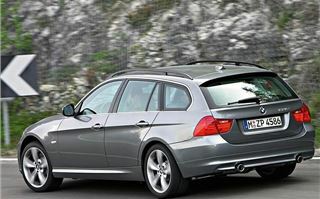 The first time I drove a new E90 3-Series I crashed it. We were supposed to be experiencing blowouts on a bend at a test track. The brief was to lock it on cruise control at 80, take it once round the bend like that, then, second time round, the passenger’s job was to throw a switch that pulled the valve out of a back tyre. First blowout on ordinary tyres; second blowout on Bridgestone runflats. Except I forgot that the bend after the 80mph bed tightened up and there was no way through it at 80 in cruise control. So we understeered onto some gravel, had a little 80mph rotation, kept the engine running, then got on with the real job. And, of course, the car handled it brilliantly. Without Dynamic Stability Control, on standard tyres, the rapid deflation led to a spin. With DSC, it didn’t. Then, without DSC, when the runflat deflated, the result was as undramatic as the standard tyres with DSC. After that we did 10 miles on rural Italian roads in a 320i with a front runflat running flat. The 10 miles with a rear runflat running flat. All a very impressive demonstration of BMW DSC and Bridgestone runflats, but hardly a fair introduction to the new E90 3-Series. 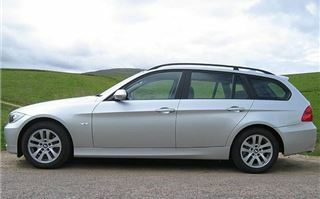 So today, we went to Scotland and drove the new 320dSE Touring, which came on Michelin Pilot Primacy 205/55R16 runflats. 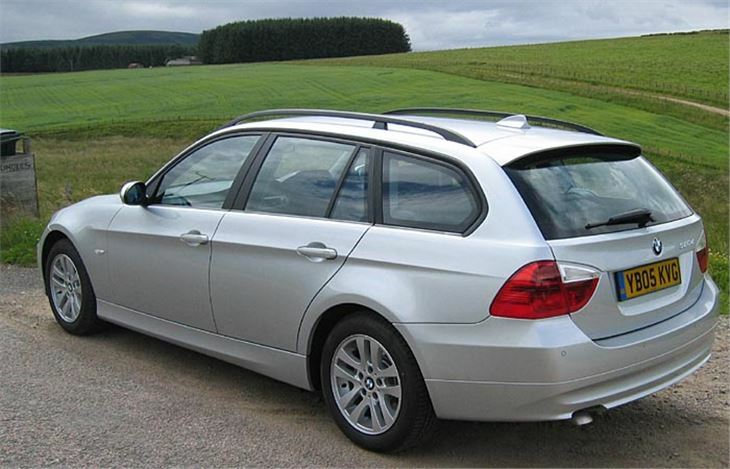 This is likely to be the best-selling E91 3-Series Touring. It may have a diesel engine, but pumps out 163PS with 340Nm torque and revs so freely to 5,000rpm it feels like a gutsy petrol. 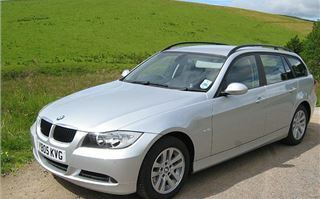 And, though the range will include a 330d with 228bhp and a massive 500Nm torque, the 320d is still a sports car. With ideal 50/50 weight distribution and a 25% stiffer shell than the old car, it goes and handles like a true rear-drive thoroughbred. It rides well on those Primacy runflats with very little road noise even on rough, chewed-up surfaces. 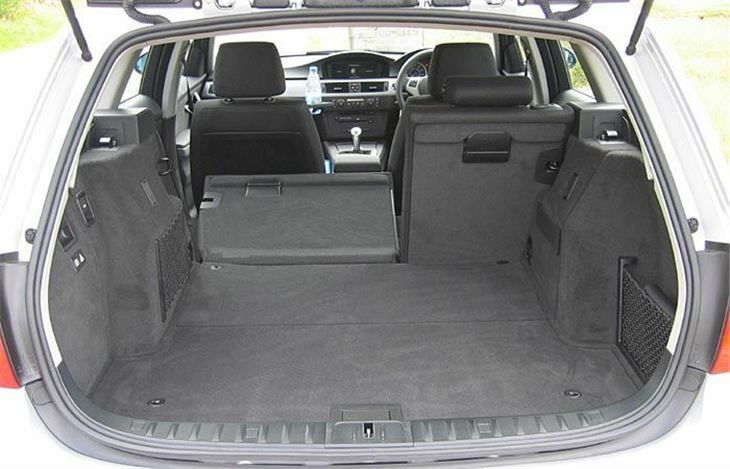 And with a bit more room in the back than the old E46 Touring, it can handle all the luggage, dogs and DIY duties of a proper station wagon. 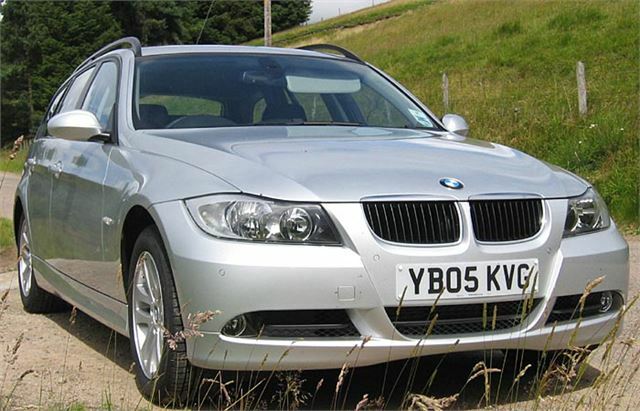 It’s even reasonably good value because although BMW asks £25,905 for the SE (or a more reasonable £24,875 for the slightly lower spec ES) and though discounts aren’t exactly given away, the 3-Series traditionally hangs onto its value well. The Touring hangs on better than the saloon because, though demand for new saloons is greater from fleets, demand for used Tourings is greater from the public. The only flies in its ointment are the contortions some people’s arms have to go through to change gear. The lever is about 2” too far back. Both I and my co-driver had to consciously lift our elbows to avoid banging them on the console box. 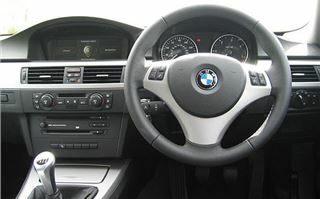 So if you see 3 Series drivers walking about with strangely bent arms they may be suffering from Repetitive Gearchange Syndrome. We also drove the 325iSE, which comes on bigger 17” wheels and 225/45R17 runflats. 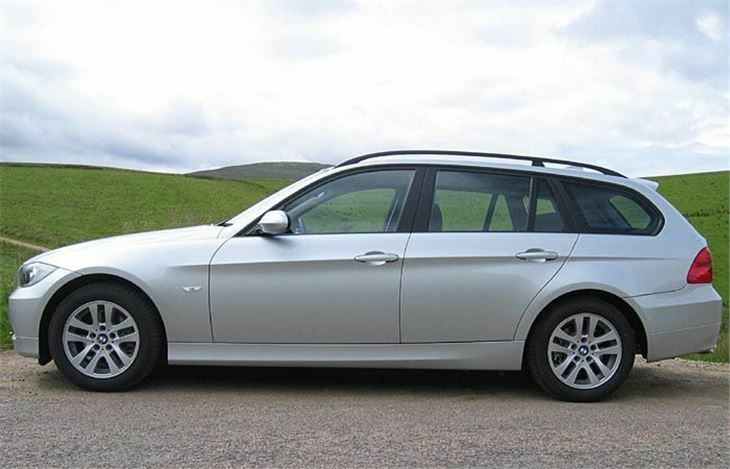 This has that wonderful, smooth, banshee howl of a BMW straight-six and bags of power to get you through the bends, but with two more cylinders up front naturally feels a bit more nose-heavy than the 320d. It’s a much faster car, of course, if you’re into outright speed. 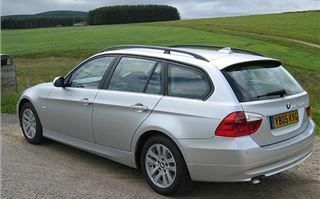 But it wouldn’t be long before the fuel computer reading of the 320d begins to win you over. And that’s just the start of your choices. The 320i I drove on the flat runflats had bags of low-speed torque for a petrol engine and prices that start at £23,040. The 330i gets to 60 in less than six seconds and goes on to a top speed artificially limited to 155. The 330d isn’t far behind it. And if you can’t get on with the crooked arm gearchange, there’s always a 6-speed automatic. To get this car into perspective, many years ago, three of us managed to double the 70mph speed limit in an old 3.8 E-Type with one lad lying on the parcel shelf. 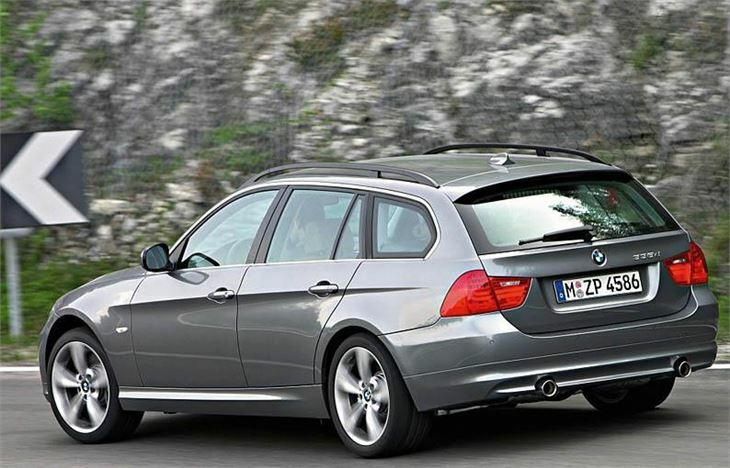 The 330i Touring is at least 15mph faster even with five aboard, plus the dog.